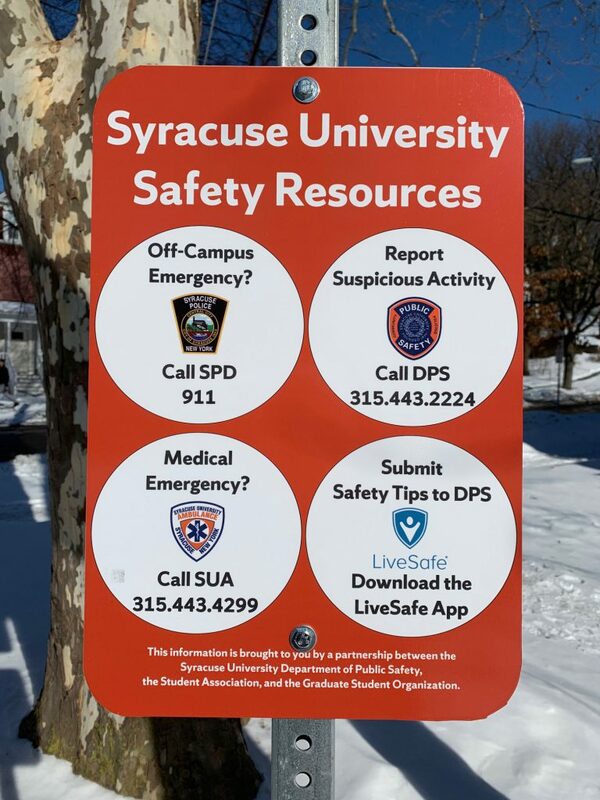 Syracuse University’s Department of Public Safety (DPS), Student Association (SA) and Graduate Student Organization (GSO) teamed up to create and recently install 50 safety resource signs in the East Neighborhood and other streets near off-campus student housing. “The signs are in the most populated parts of the immediate Syracuse [University] off-campus area,” says Obi Afriye, the GSO senator sponsoring the initiative. The signs are visible to students on Euclid Avenue and Clarendon Street from Comstock Avenue to Westcott Street; down Comstock Avenue from Euclid Avenue to Madison Street; and on University Avenue and Walnut Place from Waverly Avenue to Madison Street. Each sign promotes safety resources, including DPS, Syracuse University Ambulance (SUA) and the Syracuse Police Department (SPD). “Students may not realize whom to call in an emergency,” says DPS Chief Bobby Maldonado. “DPS will respond to any student call but does not have jurisdiction in off-campus neighborhoods. We are always a resource for students, and, if appropriate, dispatchers will contact the Syracuse Police Department on behalf of student callers. “SUA will respond to any student, and if SUA is out of service, the call will roll over to DPS,” he adds. The original idea was to increase the number of blue lights off campus, but Maldonado and Ofriye decided that a better resource would be to inform students of all of the safety resources available to them in a real-time emergency situation. “Sometimes students are out and about, especially in the East Neighborhood, and they don’t have access to quick resources or information about how to communicate in an emergency,” Maldonado says. The safety resource signs were installed on existing street signs. DPS, GSO and SA have also teamed up to have printed cards with safety resource information created and distributed to students in the coming weeks. The initiative took four months to complete. The $4,125 cost of the project was split among the three organizations, with DPS contributing $1,225, and GSO and SA each providing $1,450. “When you think of community policing, this is really what it speaks to,” Maldonado says.